On November 6, 2015, INBAR Sanya Bamboo and Rattan Technical Training Base and INBAR Institute for Tropical Forest Plants were established in Sanya, Hainan. Prof. Jiang Zehui, Vice Chair of the Committee of Population, Resources and Environment at Chinese People’s Political Consultative Conference (CPPCC), Co-Chair of INBAR's Board of Trustees, and Director General of the International Centre for Bamboo and Rattan (ICBR), Ms. Hu Zhangcui, Director General of the Department of Science and Technology of State Forestry Administration (SFA), and Mr. Wu Yanjun, Mayor of Sanya Municipal People’s Government, attended and addressed the establishment ceremony. 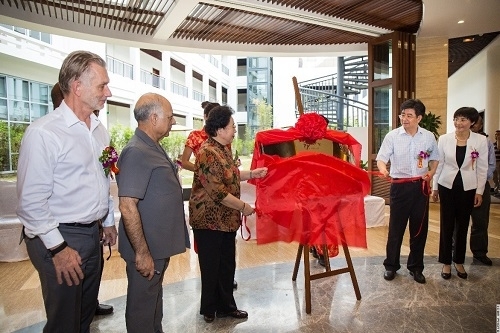 At the ceremony, Prof. Jiang Zehui, together with other guests of honour, inaugurated these two new institutions. Attendees included Dr. Maharaj Muthoo, Chair of INBAR’s Board of Trustees, members of the Board of Trustees, diplomatic envoys to China from over 20 member states of INBAR (including Ghana, Cameroon, Bangladesh, and the Philippines), as well as directors from the Department of Development Planning and Assets Management and the Department of International Cooperation of SFA, ICBR, the Preparation Office for the Research Center of Carbon Sink of SFA, the Experimental Center of Tropical Forestry of Chinese Academy of Forestry, the Forestry Department of Hainan Province, Sanya Municipal People’s Government and related agencies. Dr. Hans Friederich, Director General of INBAR, hosted the ceremony. 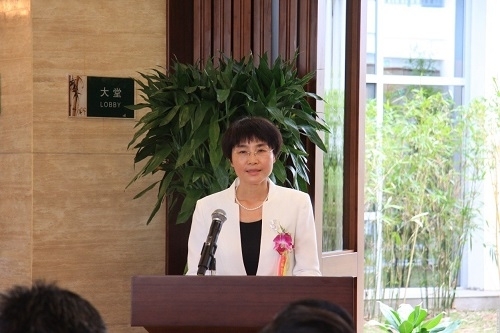 In her address, Jiang Zehui highlighted the positive role of these two institutions in helping INBAR to better fulfil its mission and aim by supporting its scientific research in tropical bamboo and rattan, international exchange, technical training, and talent development. Jiang also stressed their importance in promoting the collection and cultivation of tropical bamboo, rattan, trees and flowers in China and across the world. 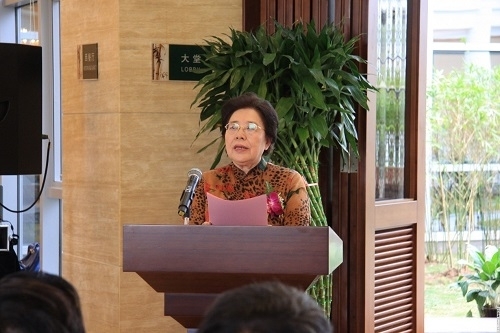 She expressed her hope that the training base and the institute will serve global bamboo and rattan development, national strategies, and regional and industry development through innovation, making their due contribution to the sustainable development of bamboo and rattan, the development of Hainan International Tourism Island, and the environmental-friendly development of Sanya. Wu Yanjun expressed his congratulations on the establishment of INBAR Sanya Bamboo and Rattan Technical Training Base and INBAR Institute for Tropical Forest Plants. Wu underlined that the bamboo and rattan industry is a green industry with a great potential and a bright prospect. He believed that these two institutions could play a significant role in the development of bamboo and rattan research, personnel training, and information sharing in Sanya and in the improvement of the cultivation and processing of bamboo and rattan in Sanya. 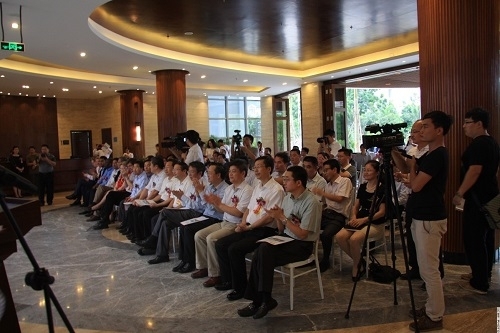 Wu also expressed his belief that with joint efforts, the training base and the institute will have a bright future. 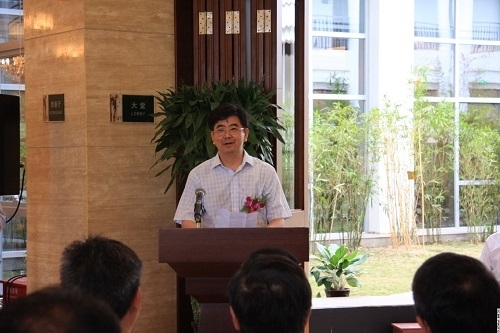 Hu Zhangcui noted that Sanya is well positioned for scientific research, technical training, international exchange, and talent development in the field of bamboo, rattan, and tropical forest plants. 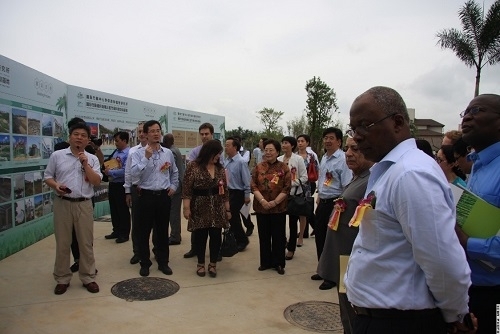 The establishment of the training base and the institute creates favourable conditions for member states of INBAR to conduct targeted technical activities; furthers research and utilization of biological resources including tropical bamboo, rattan, rare trees and flowers; and promotes the balanced development of Sanya and the implementation of Hainan’s ecological strategy. Hainan is the only tropical island among China’s provinces. It boasts rich tropical plant resources including tropical bamboo, rattan, rare trees and flowers. With the establishment of INBAR Sanya Bamboo and Rattan Technical Training Base, member states can now benefit from China’s good practice in the preservation and utilization of tropical bamboo and rattan. The Institute for Tropical Forest Plants of ICBR focuses its research on tropical trees, flowers, bamboo, and rattan in China and across the world. The institute will conduct germplasm collection and ecological monitoring whilst enhancing the research and utilization of tropical endangered and endemic biological resources in China and across the world.